You spend a lot of time in your vehicle, it's important to keep it tidy! 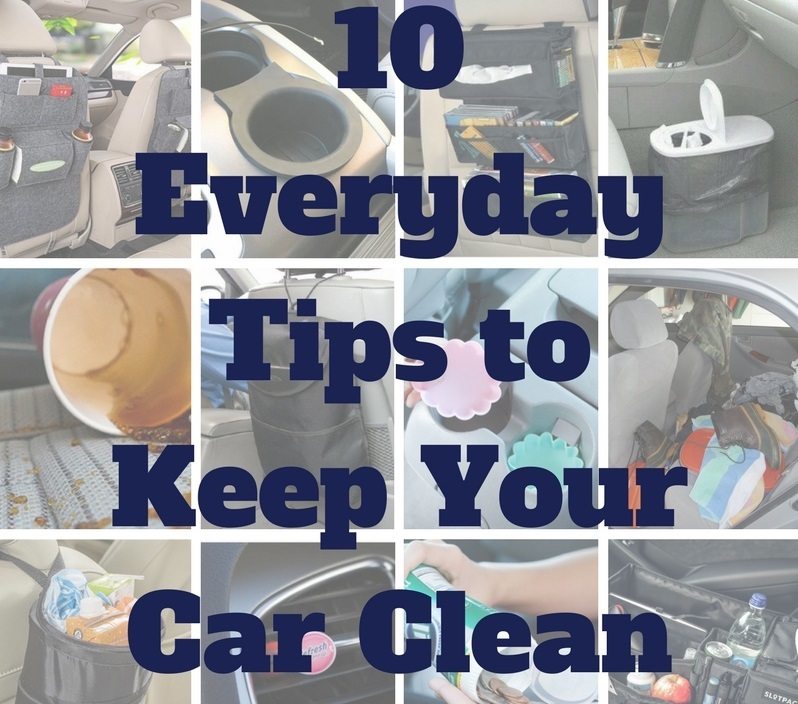 Here are ten tips you can use every day to keep your car clean. Always keep a trashcan in the car so you don’t have to gather up trash later. Whether it’s a plastic bag or a travel trash container, there will be a designated place for it to go so it’s not spread throughout the car. Just don’t forget to take it out when it’s full! Drips and dribbles can make your cup holders sticky. You can buy a liner for your cup holders or use silicone cupcake liners to prevent the liquid from reaching your car. Then you can just take them out to clean! An underrated way to keep your car feeling fresh and clean is to use an air freshener. You don’t have to dangle one from your rearview mirror; a lot of companies make air fresheners that can attach to your vents so the air coming out smells good! When a spill happens, you might need something better than fast food napkins to clean up the mess. Keeping a package of wet wipes or Clorox wipes in your car is an easy way to clean on the go. If the mess doesn’t come inside your car, you won’t have to clean it! Try to get any mud, dirt, or snow off of your shoes before climbing in. Instead of letting your belongings pile up in the back seat, just grab something every time you get home. That way you won’t end up with a mountain of stuff to carry in when you finally decide to clean. Remember to try to take in what you brought with you that day and don’t forget to look under your seats! There are organizers made for the back of the front seats that can be used to store travel games and activities, plus they keep your kids from kicking the back of the seat. You can also make your own using a shoe organizer. For the front seat, you can find dividers with compartments for your center console. It seems like you can always find change on the floor or between the seats of cars. If your car doesn’t have a change organizer, keep it all contained in a sealable container to keep it from rolling around everywhere. Then it will also be a lot easier to find your quarters when it’s time for a car wash! The longer you wait to clean up a spill, the harder it will be to clean up later. By taking a minute to clean up a mess right when it happens, you could save yourself from a permanent stain. Of course the easiest way to keep your car clean would be to not eat in it at all. If you have to eat in your car, try to bring it in a container that can catch crumbs. This will save you a lot of time trying to clean later. And if the container is sealable, then it prevents your trash from ending up on the floor. If you’re in the market for a new vehicle, Swanson's Cars & Trucks has a fantastic selection of pre-owned vehicles! Browse our inventory online or stop by today 2209 N 650 W, Warsaw (right on US 30 near Atwood)!